My stories and recipes are from my childhood in Scotland, and my life in London and America and now Copenhagen. I write about experiments in my own kitchen. This website started as an extension to my catering business. It has now morphed into posts about my travels and, more and more, living as an ex-pat in Copenhagen. I strongly believe that cooking is really a few basic techniques applied to ingredients you have to hand. So French cooking is characterized by local ingredients such as onions, garlic and wine. Italians use a lot of tomatoes, basil and olive oil. In Scotland we can do amazing things with oatmeal, salt, lard and a deep fat frier! Seriously though we grow amazing produce such as raspberries and potatoes (have I mentioned my potato obsession?) and our fish and meat are second to none. Being in Denmark is a little like being back in Scotland. It has a cooler climate producing food that takes longer to grow and as a result has a more intense flavor. Food appears in seasons and then disappears. There are also a lot of pigs, so pork is an important part of the diet and takes center stage at Christmas. I have been writing for a few years now but the blog was really an extension of my amateur catering company. Through my blog I could share my recipes with clients and friends. The website was only really created because a friend wanted to practice. My company was a dream come true, I had always wanted to open a tearoom and also to help organize and cater parties. 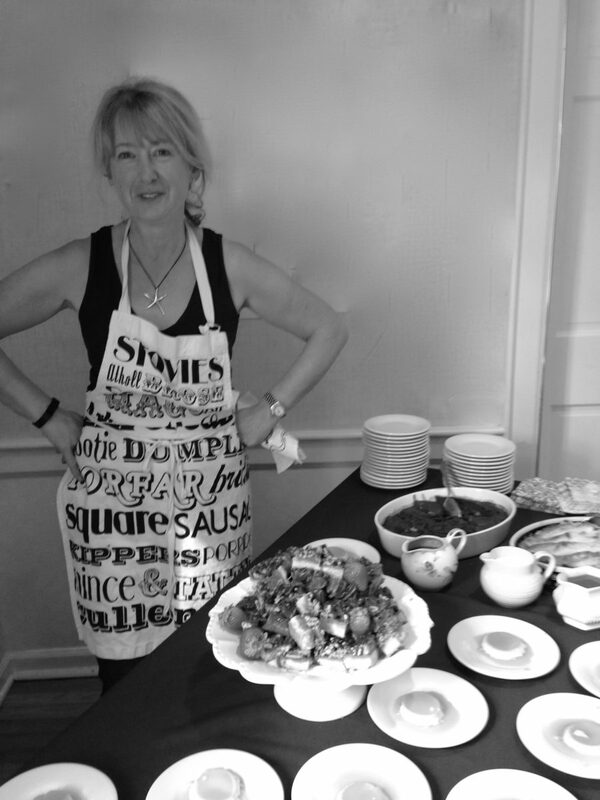 I was thrilled when the Darien Community Association (DCA) allowed me to play in their professional kitchens and cater a variety of events in the stately setting of their fabulous historic home. And for the last four years what fun we have had, doing things like pop up afternoon teas, themed lunches and breakfasts. I also had the pleasure of catering private events, bridal and baby showers, parties and celebrations. I have no professional catering qualifications, although I still dream of going someday. I have simply been cooking for a very long time so all the recipes I am sharing are real. I make real food with real ingredients for real people. I am now living in Copenhagen as my husband landed an exciting new job. With children in America and family and friends in the UK I spend my time traveling between the fabulous East and West coasts of America, beyond trendy London and stunning Scotland. No catering just now, apart from helping friends out, so taking the chance to develop my website and document all the recipes I have promised over the years. Where possible I will give the core recipe and then offer ways of adapting it. Once you master the basics you can cook anything. There are recipes I regard as core to cooking. Once you master the ability to make a sauce, a salad dressing, a basic cake you can start playing with ingredients. My recipes are suggestions and should be seen merely as starting points for your own adventures. A few words on my name. It was taken, as any Brit will know, from the brilliant television series Absolutely Fabulous or Abfab as it was affectionately known. I always rather fancied myself as Patti, the glamorous character played by the stunning Joanna Lumley but in my heart I knew I was Eddie, the always overweight, bumbling and slightly ridiculous character Jennifer Sanders wrote for herself. The name is meant to be a bit of a joke as if you ask any Brit about a party or event they will quite often reply that it was 'absolutely fabulous', high praise indeed. However, it was the goal I set myself each time I catered. And a few words of warning about this website. I am fortunate to be able to eat anything, although liver and all things offal and I are not best friends. So this website is not super trendy, offering only gluten and dairy free, vegan or paleo inspired recipes, although they are there somewhere. I am also not going to promise you health and mental benefits if you follow my blog. All my recipes are for food that I make and enjoy, that I think you might enjoy too. I have been blessed over the last few years to have been able to cook for a large number of lovely people and I promised to share recipes that I used and that have worked well. I also have to mention that I have the most fabulous friends who worked with me and supported me tirelessly in my venture. Over the last few years we have become a first class team and that might just be what makes me proudest of all. I am also posting a photo of my gorgeous family taken Christmas Eve 2013. by my, oh so talented, friend Kate Stoupas.